This county was named in honor of Captain Meriwether Lewis of Lewis and Clark fame. That expedition was in 1804-1806. This western Lewis County community has a name meaning "strong prairie." Incorrect, but a bit easier to pronounce, was the name Baw Faw. To complicate matters even more, it is on Boistfort Road, spelled with a t. Evidently usage has dropped the hard-to-pronounce letter t. But notice that the Yahoo map retains the letter t in their spelling. The Roundtree, White and Buchanan clans, members of the Christian Church from the midwest, were the first settlers in the area, as early as 1853. The church is thought to have been established in 1863. Had the church ceased to meet? Or did Warren simply get them to select leaders and in that sense "organized" the church? The Disciples Year Book of 1892 lists 25 members at Boistfort. Disciples historian Peterson also included Boistfort in his 1897 listing of churches. Chehalis, Sept. 28. -- At a meeting recently held at Boistfort, Lewis County, Washington by Elders Tinley and Boyles, 18 persons were added to the church. The elders, who had formerly served but resigned, were selected again to serve the congregation. The meeting was a splendid success. From this we conclude that the church had been functioning for some years before the report was written. Circuit-riding Judson Brown included "Baw Faw" on his monthly preaching rounds during 1900. The church probably closed as the families move to Centralia and other larger communities. In 1870, a Church of Christ with 27 members was established at Ford's Prairie, 0.7 mile west of Interstate 5 at the main Centralia exit. "Uncle Sid" Ford was a judge and also kept a small hotel which may be seen in the photo. Among the charter members were Dr. James and Emeline Roundtree of Illinois and their children Mary Adeline, Jasper and Julina Jane. 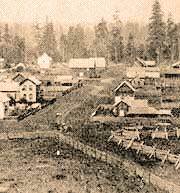 They had spent a winter at Milwaukie, Oregon after traveling with the Murphy-Davidson wagon train in 1852. James' sister Mary married Ethan Allan Shirley who became a trustee of Christian College in Monmouth, Oregon. Eventually the Roundtree family settled near Ford's Prairie and helped establish the Church of Christ. Centralia (then called Centerville) is in Lewis County. Thomas Taylor, formerly a Baptist, was the first minister. Like most of the earliest churches in western Washington, their meeting place was built on or near the military road (now Jackson Highway). In 1871 they built a 20' x 30' building at Ford's Prairie. We think that it is the low building in the photo at the right. Notice the wagon trail. The house on the left is probably the Halfway House owned by John Buchanan. There is a profile of Thomas Taylor. Joseph and Adeline (Roundtree) Borst's home is is open to the public Saturday and Sunday from 1 to 4, Memorial Day through Labor Day. Because of the coming of the railroad in 1872, the focus of the city had moved to this new area. We wonder if the new location, just one block from the tracks, proved to be noisy because thirteen years later they built at Pine and Silver, three blocks from the tracks. They built another building on that same location in 1910. "That the terms of admission to membership to and in said Church of Christ shall be that the applicant shall believe that Jesus is the Christ the Son of the living God and shall confess the name of Jesus before men, repent of his sins and obey the command of Jesus by being immersed in the name of the Father and of the Son and of the Holy Spirit." Full time workers sent out from the congregation include David Byerlee, Jewell Roberts, Carl Gelder, Lyle Sellards, Gerald VanDoren, Clinton Rigg and Jack C. Marshall. Through the years, the congregation came to be called the First Christian Church of Centralia and that common usage was made legal in 1956. In 1961 the congregation purchased land for its present facility at 1215 West Main. Some of this information has been supplied by local church historian Donna Joachim. Napavine in Lewis County is seven miles south of Chehalis, just off I-5. Its name is from an Indian word meaning small prairie. There has been none of our preaching brethren at Napavine till I went there this summer. My first two sermons were delivered in a hall where the Methodists held their service. After the Methodists had dedicated their new house of worship they invited me there, and I accepted. My first sermon there resulted my having the privilege of taking three confessions. They were all heads of families. I was about to close my service when one came forward, without invitation, and said "I wish to confess the Savior; two more immediately followed and I baptized them in the Newaukum river on next Lord's day, the Methodist minister being present. Spelling and grammar of the original have been retained. This story records the beginning of the congregation. It must have flourished for a few years because by 1913 they built the building as seen in the photo. With the coming of automobiles, members could easily drive to Centralia or Chehalis. This has been the fate of many small congregations from the past. The church no longer meets and the building was remodeled into the Napavine City Hall. Now the building is occupied by Let's Play Something.com. Disciple historian Orval Peterson lists a Christian Church in Mossyrock in his 1897 listing of Churches of Christ and Christian Churches. One of the early circuit-riding ministers was Judson Brown in 1900. The Landis family was involved in the early days of the Mossyrock Christian Church with the building being built in 1908. 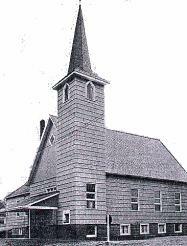 But it died and was later resurrected as the Mossyrock Community Church about 1940. Supplying the leadership at this time was Melvin Core, a local school teacher who was later ordained by the Chehalis Christian Church to the work of ministry. 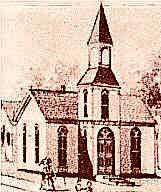 A Stone-Campbell related church was in existence here as early as 1893 because Elder Ulysses E. Harmon wrote to the Christian Standard, an Ohio publication, about the church in Boistfort. His letter was dated September 28, 1893. Perhaps the group disbanded temporarily and was restarted. 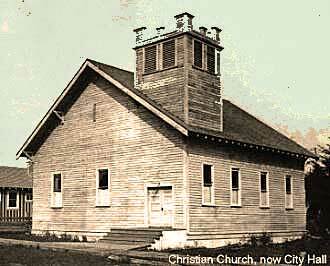 According to their own history, the development of First Christian Church began in Chehalis in 1897. R. E. Dunlap held a gospel meeting, using the Baptist Building. Attendance averaged 75 each night. By 1899, a group had formed in the home of Mr. and Mrs. Ulysses E. Harmon. Some of the early members were Mrs. C. L. Adelofte, Asa Harmon, Lucy Harmon, Ulysses E. Harmon, Ellen M. Harmon, John H. Miller, Mrs. S. E. Miller, George Miller, F. M. Rockwood, James H. Wheeler, Minnie Wheeler and William Wheeler. There was no regular preaching in the earliest years. James Wheeler, father of William Wheeler, preached some as did C. F. Goode. Judson Brown included Chehalis in his monthly preaching circuit in 1900. At first, the church met in the homes of its members. Several protracted meetings were held in public buildings. 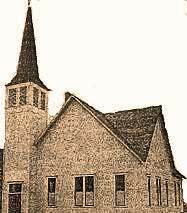 By 1904 the church had formally organized and by 1906 they were in their first building. The current building is an updated version of the original one and at the same location, 1175 Prindle Street.